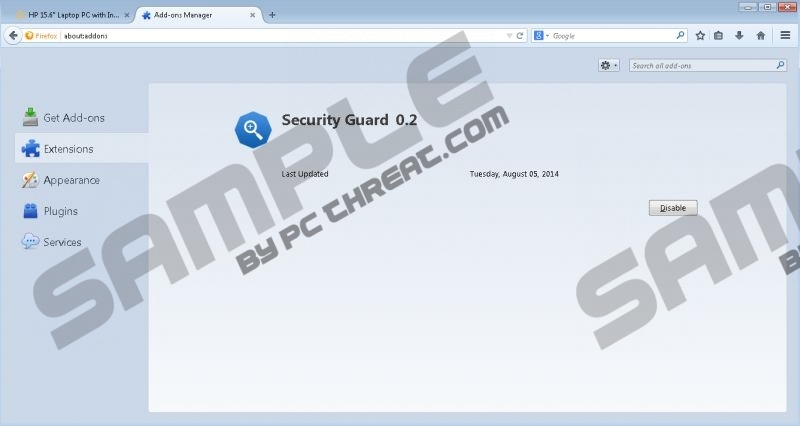 Security Guard is an application that is marketed as browser add-on that will enhance your overall web browsing experience. It should enhance the performance of your browser as well as should make surfing the Internet more secure by protecting your PC against phishing attacks and providing warnings about any potentially malicious websites. It sounds as an application worth having. Ironically, the application that should help you keep your system safe could actually expose your computer to dubious web content. In reality, Security Guard is just an average adware application that will be just as much as annoying as it is worthless. It is crucial to remove Security Guard if virtual security is important to you. Any virtual threat should be deleted immediately. The removal process is described in the instructions below. It is important to note that Security Guard is quite similar to adware applications such as WindGuard, WebCheck, SecurityUtility, and a few others. Thus, it is quite natural that Security Guard functions in a similar way as its counterparts. Once it gains access into your operating system it will install browser extensions to Google Chrome, Internet Explorer and Mozilla Firefox. Once the browser extensions are up and running your browser will be flooded with numerous commercial third-party adverts and annoying pop-ups. Browsing the web will become a frustrating experience. The only way to terminate the annoying activity is to remove Security Guard completely. What is even more alarming about Security Guard is that it could expose your system to other Internet-based infections. It has been noticed that some registry keys or files of Security Guard could be the reason your system could be implemented with a potentially malicious applications without requiring any authorization form you – the user. Also, it should be noted that some adverts could contain redirect links. Ergo, you could be redirected to potentially harmful websites. Dubious content on those websites are more than alarming as it significantly increases the risk of getting your PC infected with some unknown malware. Security Guard is certainly not the application that will improve your overall virtual security in any way. Keeping Security Guard on your operating system could have devastating outcomes and that is why we strongly advise you to remove this invasive adware program ASAP. The removal process of Security Guard is rather simple as it is possible to delete Security Guard via Control Panel. Even thought, the removal of Security Guard via Control Panel will stop the annoying and potentially harmful activities, it was noticed that some traces of the infection could remain on your operating system. That is why you should scan your system with a reliable antimalware tool after performing manual removal. Navigate the mouse cursors to the button right corner of the screen. Select Security Guard and click Uninstall. Confirm that you want to remove Security Guard. Right-click Security Guard and select Remove. Quick & tested solution for Security Guard 0.2 removal.